Oral & Maxillofacial Surgery Buffalo Grove: Do You Need to Schedule a Periodontics Appointment? If you’re looking for a periodontist in Buffalo Grove, then you’ve come to the right place! In today’s post, we’ll explain why you should choose North Shore Smile Surgery for all of your periodontistry needs. If you need to schedule an appointment, then get in touch with our office at 847-613-4933 or fill out the contact form at the bottom of this page to get started. Many people come to our office for wisdom teeth removal and to learn more about ReVita Smile®, but our office is also the place to come for periodontistry in Buffalo Grove. 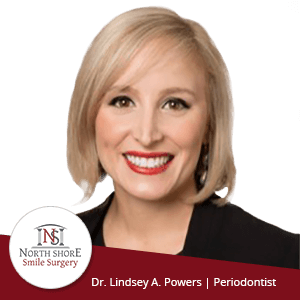 We’re proud to have one of the country’s leading periodontists, Dr. Lindsay Powers, on our team. “Certification as a dentist, including basic college education and completion of dental school to earn the D.D.S. or D.M.D. degree. Certification as a periodontist after successful completion of an educational program in Periodontology, which is accredited by Commission on Dental Accrediation of the American Dental Association. Comprehensive qualifying and oral examination covering all phases of periodontal disease and its treatment, including dental implants. So, whether you need to speak with Dr. Powers regarding gum disease (periodontitis) or dental implants, you can rest assured that you’re receiving cutting-edge treatment. Why Choose North Shore Smile Surgery? Specializing in a variety of dental services, North Shore Smile Surgery is proud to provide a warm and welcoming environment that reduces the stress many patients experience when going to the dentist. Unlike other oral surgery centers in Buffalo Grove and the surrounding areas, our office doesn’t have the cold and sterile appearance you’ve probably come to expect. We know that our patients’ experiences are just as important as the services they receive, so we’ve gone above and beyond to provide you with a comfortable, stress-free environment. You’ll enjoy beautiful hardwood floors, comfortable chairs, and even mounted televisions that can help you relax and focus on something other than your appointment. We couldn’t be more proud of our oral surgery center, but you don’t have to take our word for it! We proudly post all of our online reviews for the world to see, and you can even watch videos of our patients giving unscripted testimonials about their experiences. If that isn’t enough to convince you, then be sure to view our numerous reviews from other doctors. We hope that this post will help you to understand why North Shore Smile Surgery is the Top Rated Local® oral surgery center in Buffalo Grove. We would love to help you achieve the oral health you deserve — get in touch with our office today to schedule an appointment!